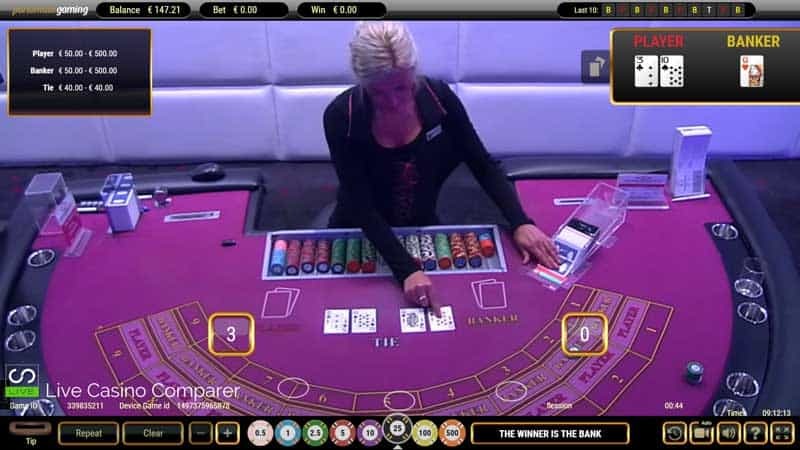 There are loads of different varieties of Live Baccarat (Punto Banco) that you can play against a live dealer online. 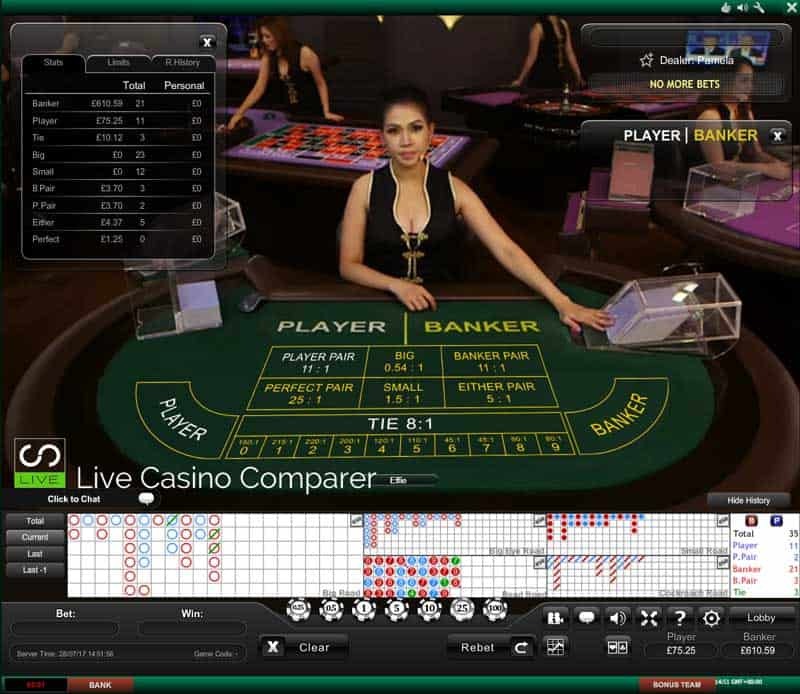 Most of the live casino software providers carry the basic game, but some offer different versions that can make choosing a game confusing. 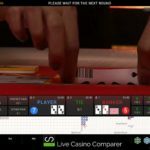 I’ve compared all the different versions of live baccarat and produced a summary of each game. I’ve also included a recommendation of where you can play. Typical differences with the games include the speed of play and the Squeezing of cards. You also get a choice of playing on your own or with others at the table. There’s also the opportunity to play alongside real players in land based casinos and you’ll even find games where you pay No Commission on Banker wins. And that’s not to mention a whole array of different sidebets. 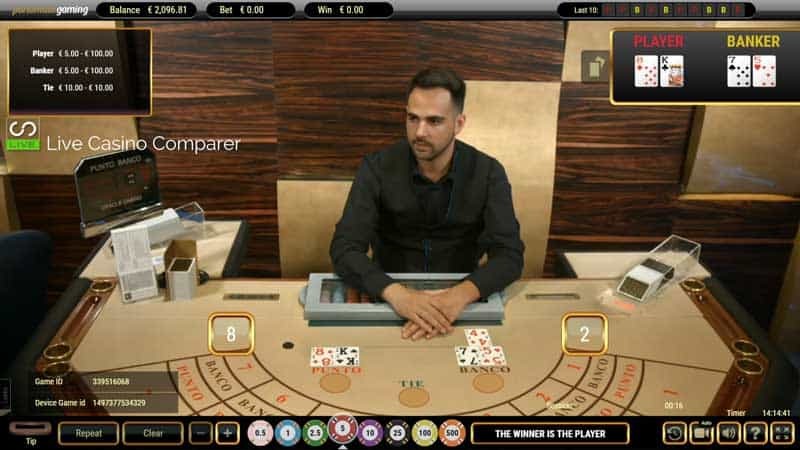 Live Streamed Baccarat – from land based casinos. The quickest game is Evolution Gamings Speed Baccarat at 27 seconds a game round. You’ll find it at Mr Green casino. For best payouts, Playtech’s No Commission Baccarat is the game to play. Play at Betfair. The Best “Squeezes” can be found at any Evolution Live Casino. Leo Vegas is the obvious choice. 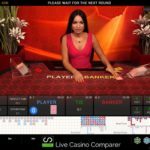 If you like playing alongside other players then Playtech tables all offer Multi Seat Baccarat. Betfair has a good selection. 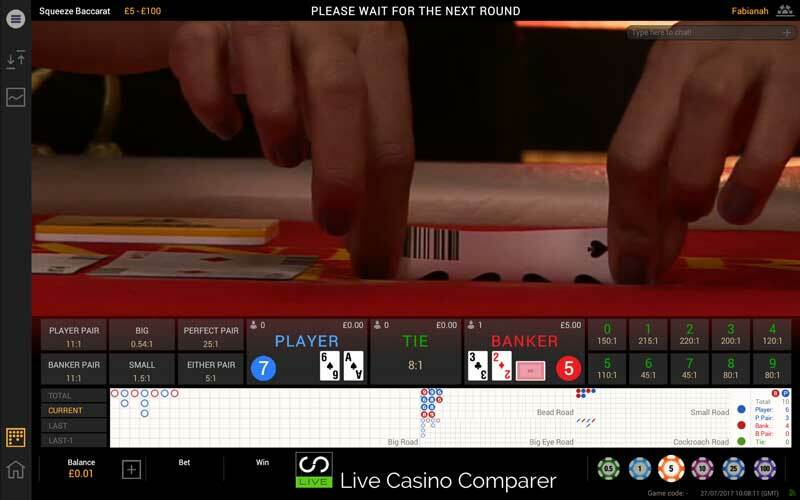 A 6 Deck game of Baccarat can be found at Visionary iGaming casinos – Try Celtic Casino. 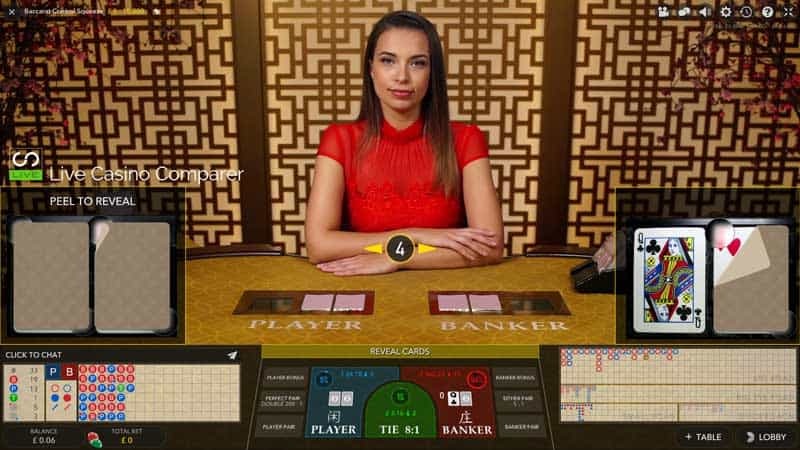 The objective of Live Baccarat is to predict which of two hands, The Player or The Banker, will win by having a hand value closest to 9. You’ll find the online version uses either 6 or 8 decks of 52 playing cards. The most popular is the 8 deck game, as it makes it slightly more difficult for card counters to gain an edge over the house. Cards 2 to 9 are worth their face value. 10’s and face cards are worth 0 points. Hands values are calculated by adding the two cards together. If the sum produces a double digit number, the hand is given the value of the second digit. For example if the hand adds up to 13, the value of the hand is 3. 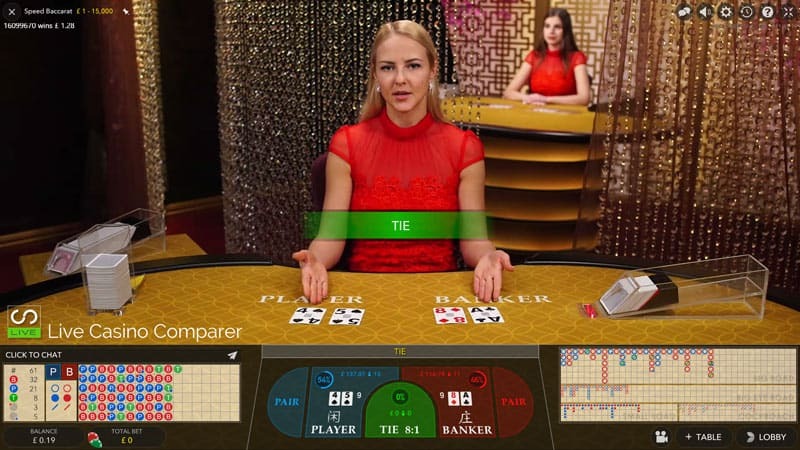 The game commences with both the Player and Banker positions being dealt two cards. The value of each hand is then calculated. A hand with a total of 8 or 9 “a natural” wins automatically and the game ends. A third card can be drawn depending on the value of the initial hand. There are some specific rules for this, in summary if the hand is valued 0 to 5 a third card is taken. If it’s 6 or 7 the hand stands. If the value of each hand is the same then a Tie is called. In most games this will result in the initial bets being returned to the players as a Push. The hand that is the highest in value wins. 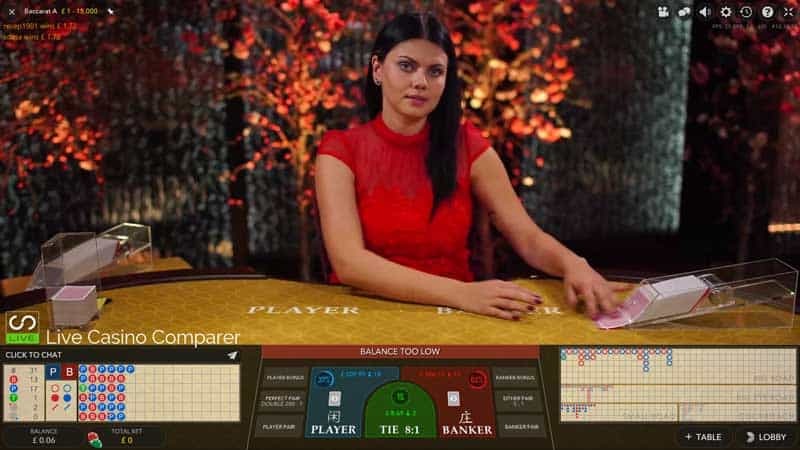 Baccarat Roadmaps, which are used by players to record the past outcomes of each hand are created automatically by the playing software. If you don’t use them you can choose not to display them. Be sure to read Wikipedia comprehensive overview of Baccarat. They do a far better job that I ever could of explaining its history and customs. Standard Baccarat games all offer the same pay-outs. There are some differences, especially in games like Bet On Baccarat and No Commission Baccarat, which I’ll cover later. A player win will pay even money 1:1. A Banker win pays 0.95:1, which accounts for a built in edge for the house. No Commission games pay Banker wins at 1:1 even money. Tie bets normally pay 8:1. There’s also a range of side bets like Pairs, Big/Small, Super 6 to name a few. You can get more information about them in my Baccarat Side Bets and game options page. 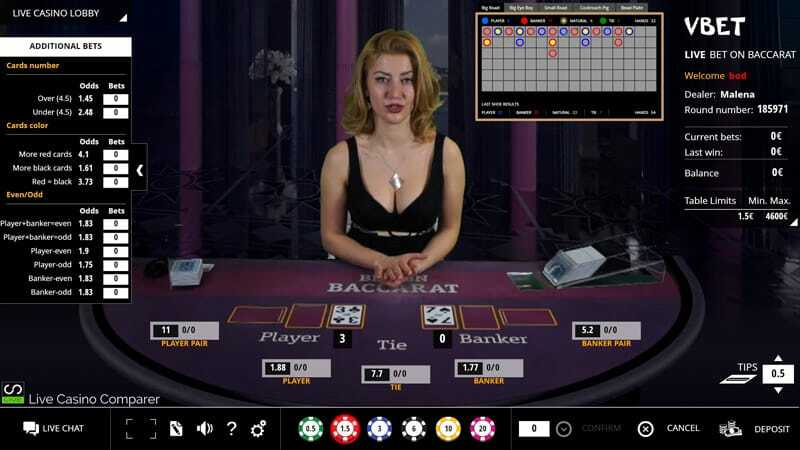 This is the basic standard game you’ll find at most online live casinos. An unlimited number of players play the same hand. When you’re playing on the table it will appear that you’re the only one playing, but you’re really sharing it with 100’s of other players. Either 6 or 8 decks are used when playing the game. For the gambler there’s also a range of optional side bets that can be played alongside the main hand. All games come with a full set of Baccarat Roadmaps. Visionary iGaming is the only supplier to use 6 decks, all others use 8. Visionary iGaming is the only supplier to offer the Banker/Player Dragon Bonus. Ezugi has the quickest game round of 31 seconds. Playtech is the only provider using the Egalite side bet. No burn cards with new shoe. Ties pay 8:1, Banker pays 0.95:1. Deal to Deal time of 40 seconds. Cards burned at the beginning of each shoe. The dealing shoe gets changed when there are only 2 decks left in the shoe. The shoe is either replaced with a full one or sometimes the dealer will perform the shuffle at the table. Non Tie bets are returned if the game is a Tie. Deal to Deal time of 30 seconds. Cards burned at beginning of new shoe. Bets are returned when a Tie occurs. (Ties pay 8:1). I quite like this playing interface for single player. The side and main bets are arranged nicely on the table. This is played with 8 decks. A shuffle occurs when the shoe is 3/4 of the way through. Side bets of Banker/Player pair, Big/Small and Pairs are optional. Game round takes 40 seconds, deal to deal. An 8 deck shoe is used. The shoe is shuffled with two decks remaining. The new shoe has first few cards burned. Side Bets of Banker/Player Pair and Sum Bonus. The game round takes 40 seconds to complete. This is the quickest of the single player games. A game round takes 31 seconds. This is played with 8 Decks of cards. Banker/Player pairs and Big//Small side bets can be played. Streamed from their Costa Rican Studio. The VIG version of Baccarat uses just 6 decks, in fact they are the only supplier to do so. The only supplier to use 6 decks of cards. Uniquely, they are the only supplier to provide the Banker/Player Dragon Bonus. The game round takes 50 seconds, which is one of the longest. The playing interface is a bit dated. Has the Banker/Player pairs side bets. The Pairs and Dragon sidebets are disabled for the last 20% of the shoe. Player/Banker Pair, Player/Banker Bonus & Big/Small side bets are optional. The dealing shoe is changed when one deck is left. A game round takes 50 seconds to complete. This is an 8 deck game. Has the Banker/Player Side bet of Pairs and also Big/Small. 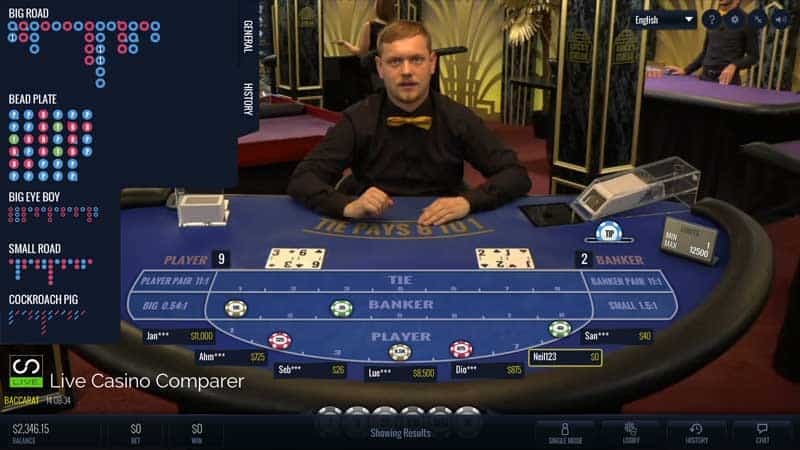 Bets are returned to player if the outcome of the hand is a Tie, only if the player didn’t bet on a Tie. 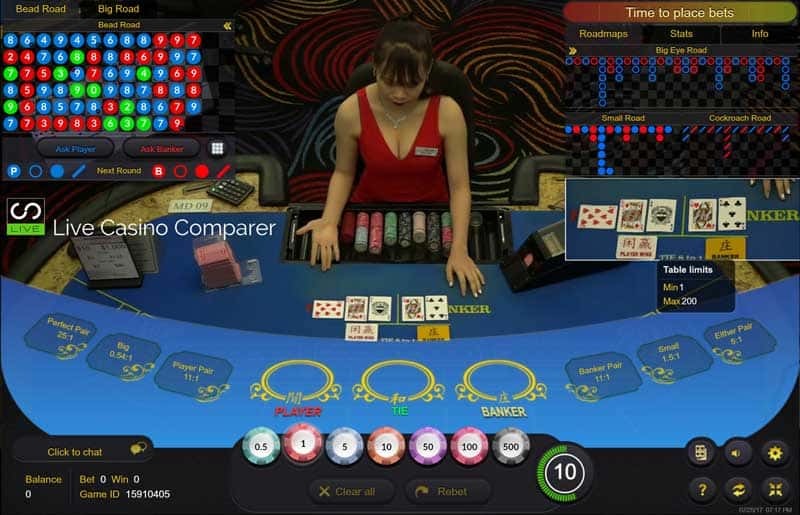 Multi Seat Baccarat is exactly the same game as Single Player Baccarat. The difference is the number of visible seating positions on the table. Some of the software providers have up to 8 seats available. They normally use the same table the single game is played on and superimpose a different “skin”, giving the appearance of multi seat. Only one Dealer/Player hand is dealt, but you’ll be able to see other players betting on the hands. Not many of the software providers have a Multi Seat option because it requires a slightly larger table to accommodate all the seating positions. As space is at a premium in most studios they like to keep their tables small. This is a reskin of their single player table. It has 8 betting positions. The game is played with 8 decks. Three sides bets can be player, Banker/Player Pair, Pairs and Big/Small. Playtech has an abundance of Multi Seat tables, and they are available from all of their Live casino studios. You’ll have a choice of tables from Latvia and the Philippines. The table language is English, except in the Emperor’s Lounge, where Mandarin is spoken. They are all 8 deck games. Side bets of Pairs, Big/Small and Egalite can all be played. Game round takes 30 seconds. 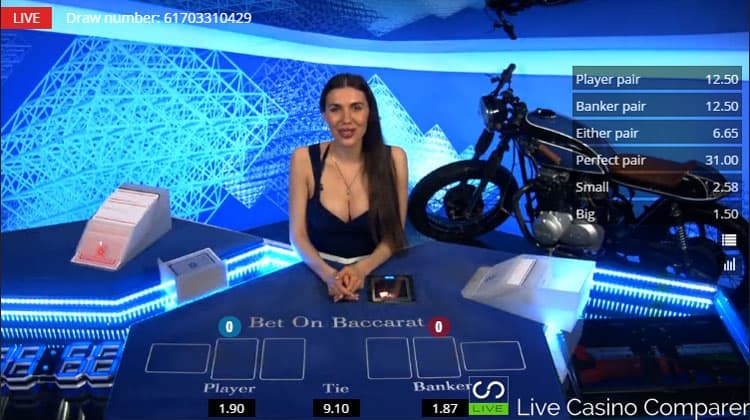 Speed Baccarat is the newest version of Live Baccarat to hit our screens. It’s been designed for players that like a quick game. There is no ceremony in the game, all cards are dealt face up and any extra cards are dealt as soon as possible. Evolution Gaming and Playtech are the only providers to label a game “Speed Baccarat”. 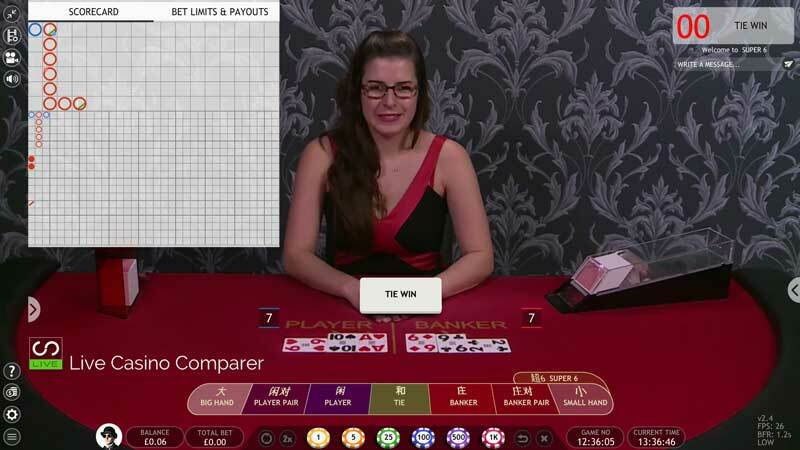 It follows the growing trend for faster games as we’ve already seen with Speed Roulette. Playtech already have a quick game. Their Deal to Deal time for normal Baccarat sits at 30 seconds, (their Speed version is slower!). Evolution Speed Baccarat peaks at 27 seconds. The game uses 8 decks. Game rounds takes 27 Seconds. Transmitted from the studios in Riga, Latvia. There’s nothing speedy about Playtech’s Speed Baccarat. It’s streamed from the studios in the Philippines. Banker/Player Pairs, Big/Small and Egalite side bets. Game rounds takes anything from 34 – 40 seconds. Which is slower than their normal game. The “Squeeze” in Baccarat refers to the process of slowly revealing the value of a card by performing an almost ritual like turn of each edge of the card. The player then peeks at the markings to determine it’s value. The superstitious believe the slower the squueze the more likely it will be the card to make the hand win. In land based games the honor of performing the Squeeze lays with the player who has bet most on the hand. 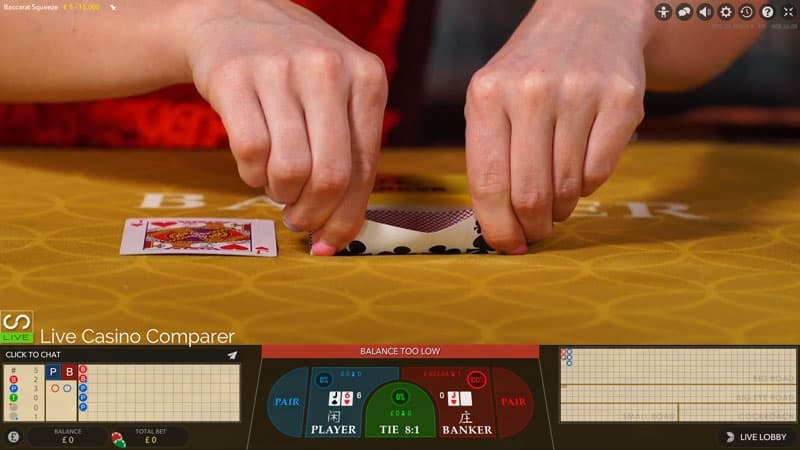 The Squeeze in Live Baccarat is performed by the dealer, for player controlled squueze see below. The hand with the most money bet on is the one chosen to be Squeezed. 8 decks of cards are used to play Baccarat Squeeze. The cards are used once and then destroyed. I explain more about this in my Evolution Riga Trip Report. You can play 2 side bets. Banker/Player Pairs and Bonus. From deal to deal the game round takes approximately 1 minute 8 seconds. Dealer performs the squueze on the hand that has the most wagers. With Playtech you have two Squeeze options. They are essentially the same. One is Squeeze Baccarat and one is Prestige Mini Baccarat with Squeeze. The difference? Nothing game wise, just where the tables are streamed from. Both are 8 deck games. 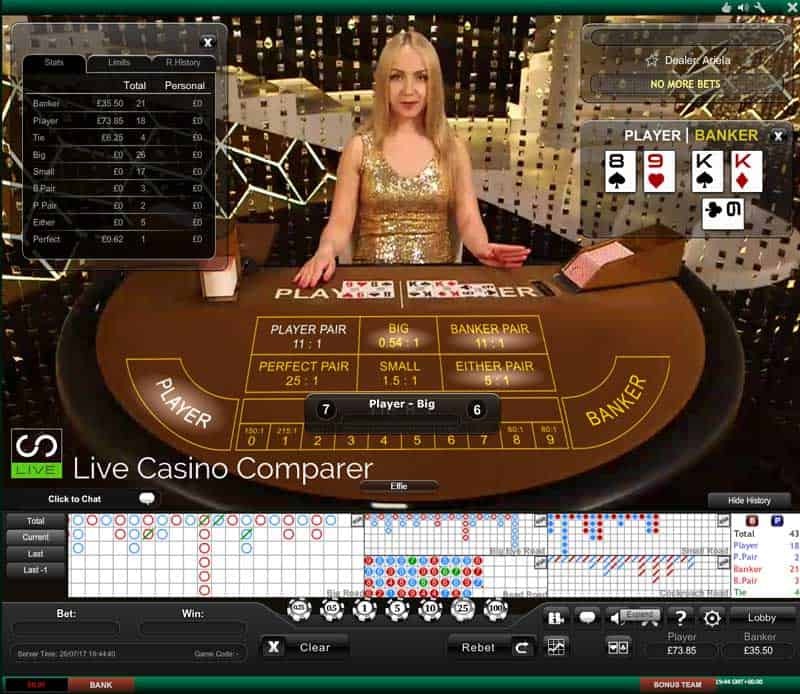 You can play a range of side bets. Banker/Player Pairs, Pairs, Big/Small and Egalite. The game round takes 1 minute 14 seconds from deal to deal, which is slightly slower than the Evolution version. This is Baccarat Squeeze but the squeeze is performed by the player. 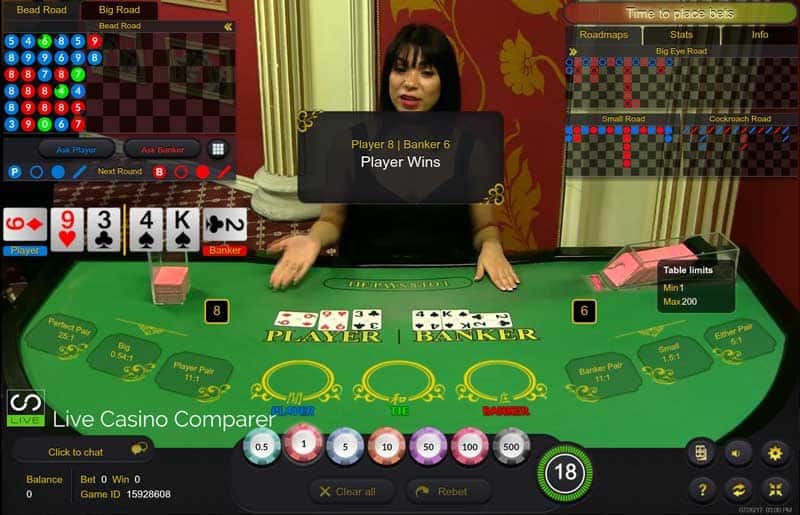 The player can squeeze all cards using a computer generated image of each card. You use your mouse to peel back the corned of the cards to reveal the value. The cards are dealt face down on the table by the dealer and players have a certain amount of time to act before the cards are revealed. The game is not as slow as you’d think and is actually played quicker than the regular Squeeze by the dealer. Essentially the same as game as Baccarat Squeeze. This version of the game uses 8 decks of cards dealt from a scanning dealing shoe. The playing cards are dealt face down on the table so players can’t see them before they are squeezed. Players can Squeeze either or both hands. Loads of side bet options are available. Pairs & Bonus Bets for the Banker/Player. Game round takes 1 minute from deal to deal. The streaming isn’t as sharp as other versions. The game uses 8 decks of cards dealt from a manual dealing shoe. 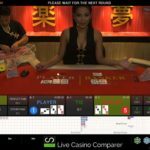 3 sets of side bets can be played. Banker/Play pair and Bonus and BIg/Small. Game round is quicker at 52 seconds. Player can Squeeze the cards of both hands. 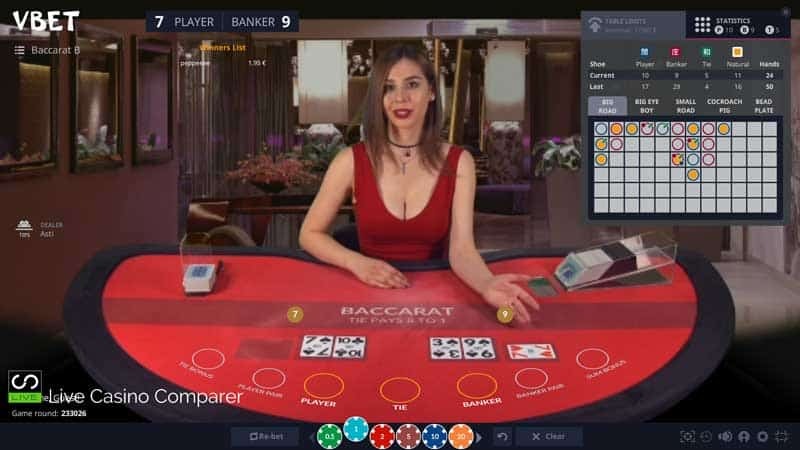 Mini Baccarat is a bit misleading, as the online live version is exactly the same as normal Baccarat. There is no difference whatsoever in the online games, no matter what other sites may be saying. The only difference is the name.! So why the different name? Well, this hails back to a time in Land based casinos when there were two versions. Standard Baccarat started as a 14 player game. Under the supervision of a dealer, players took turns to deal the cards as the shoe was passed around the table. As a result the game took a very long time to play. Mini Baccarat was developed as a quicker game for less players with a croupier dealing the hands. The game also offered lower stakes, although in the online version there is no such distinction. Playtech is the only supplier to persist with the name Mini Baccarat so I’ve included this category for completeness sake. 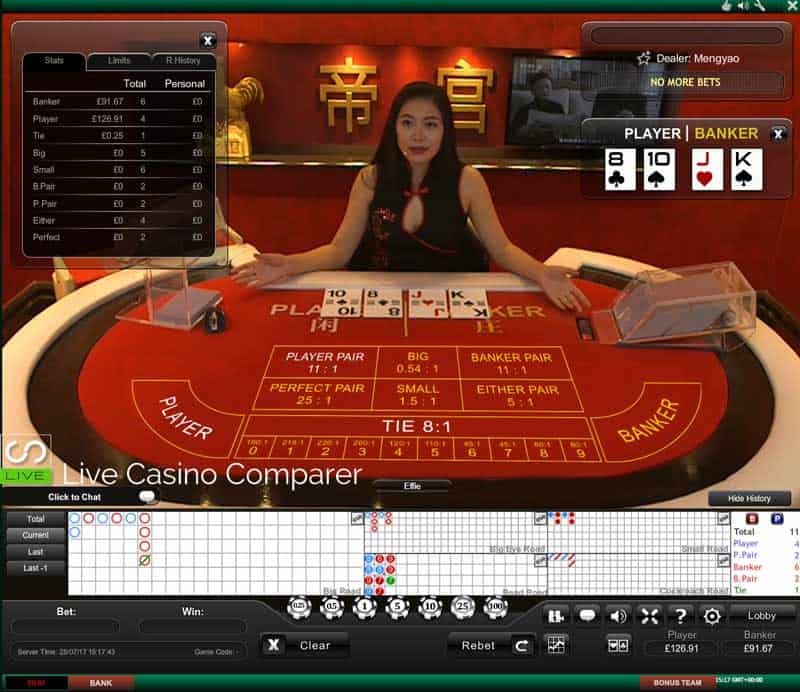 Mini Baccarat tables stream from the Philippines Studios. You’ll get tables in English and Mandarin. A game round takes 30 seconds. Playtech is the only supplier to offer an optional side bet f0r a Progressive Jackpot in Baccarat. 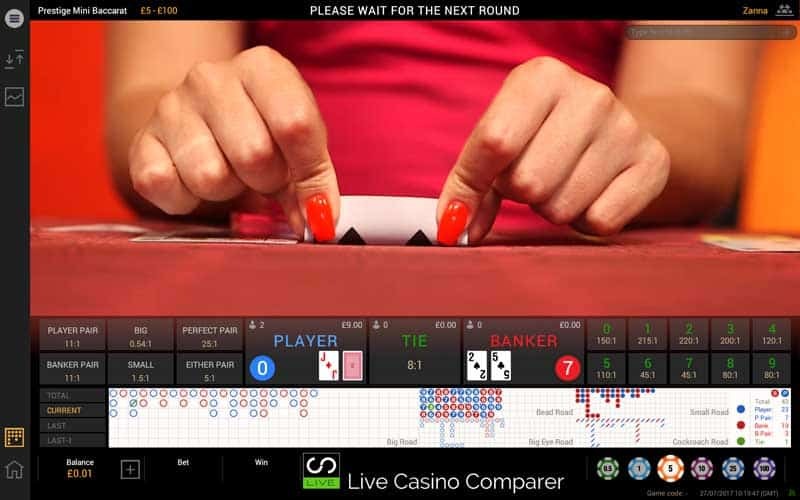 The side bet can be played alongside the main hand and pays out on a number of different hand outcomes. The Jackpot gets paid if the Player and Banker both get the same suited Ace+8. 10000 x stake pays if both of the Player and Banker hands get a suited Ace+8. 1000 x stake pays if the Banker and Player get Ace+8. The following 4 carded hands will be paid. Tied 9′ s get 25x stake. Tie on 8’s get 20x stake. Tied 7’s get 15x stake. Tie on 6’s get 10x stake. 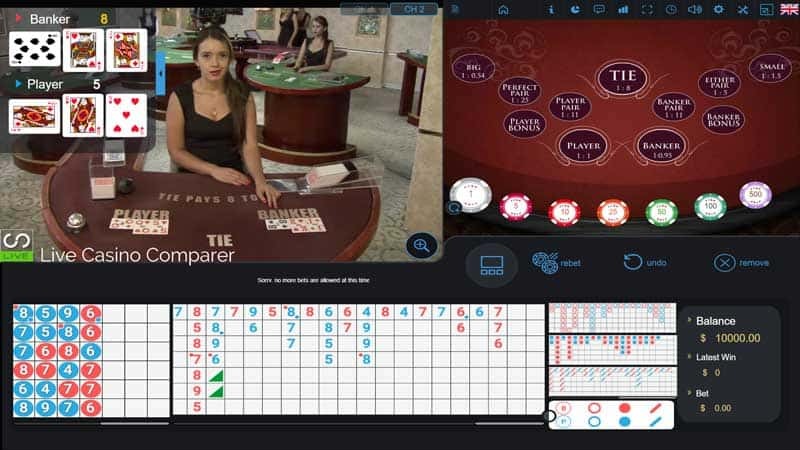 Same as Playtech’s standard Baccarat games. It has 4 side bets, Banker/Player Pairs, Big/Small, Egalite and the Progressive Jackpot. The game uses an 8 deck dealing shoe. No Commission Baccarat pay banker wins at even money 1:1, rather than the traditional 0.95:1. It make sense to play this as there is no house edge and you get more for you Banker wins. Streamed from Playtech’s new studio in Riga. It has 3 side bets, Banker/Player Pairs, Big/Small and Egalite. The game uses 8 Decks of cards in the dealing shoe. Banker wins pay 1:1 even money. Streamed from Evolution’s Riga studio. It has 3 side bets, Banker/Player Pairs, Banker/Player Bonus and Super 6. Banker wins with a 6, only pays 50% of initial stake. Super 6 side bet pays 15:1 when Banker gets a 6. 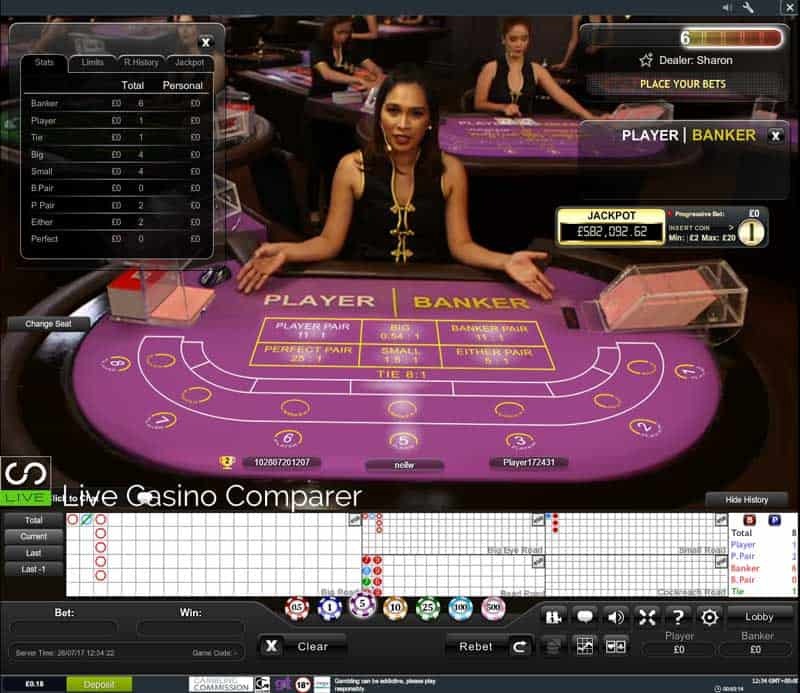 This is probably the faster growing trend in Live Baccarat, streaming from Land Based Casinos. It’s been around for a while but the take up across all operators has been slow. 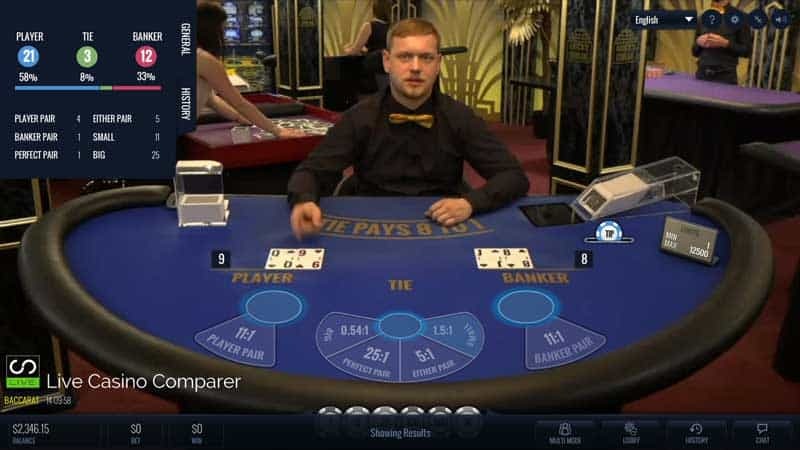 But as we’ve seen with Live Streamed Roulette, there is a momentum switch going on, as more and more land based casinos are making their tables available for online players. 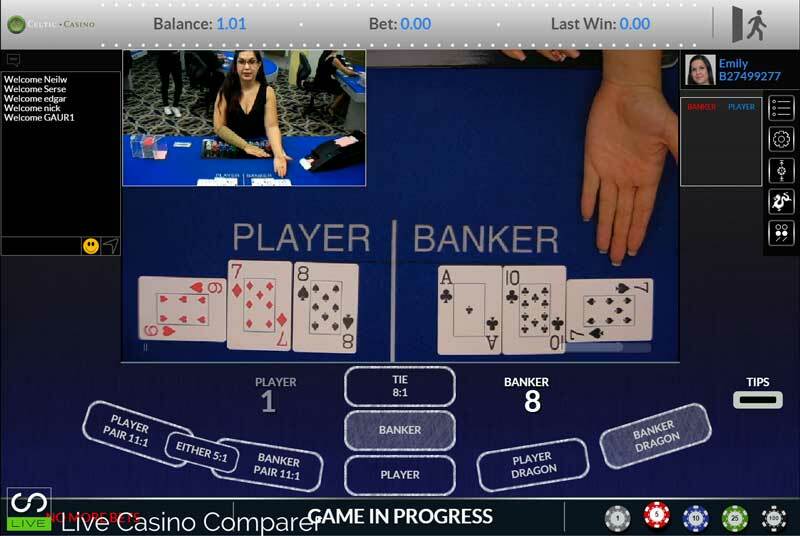 Currently only two suppliers are providing live streamed Baccarat. Ezugi and Wirex (Portomaso). You’ll play alongside real money players, but generally you don’t get to see who the people are, just the bets they are placing and the odd hand coming into shot every now and then. The games tend to be a bit slower than the Studio versions, as the dealer has to make payouts to the players at the table. 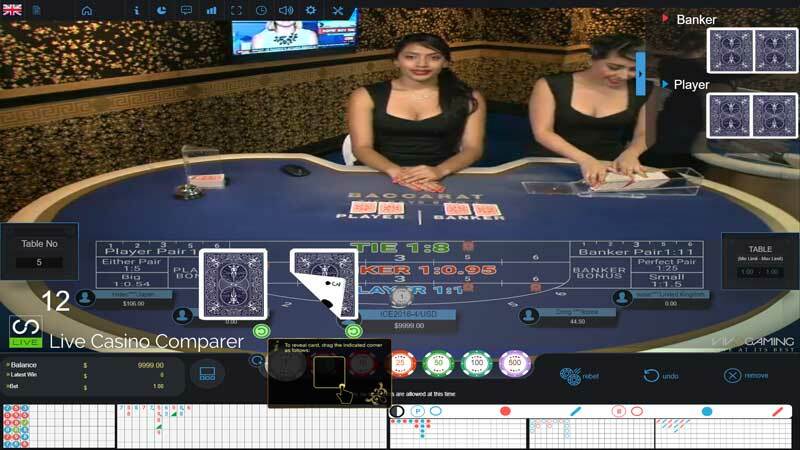 Ezugi streams Live Baccarat from the Queenco Casino in Cambodia. The game uses 8 Decks of cards in Single player mode. It has 2 side bets, Banker/Player Pairs and Big/Small. A game round takes 45 seconds. 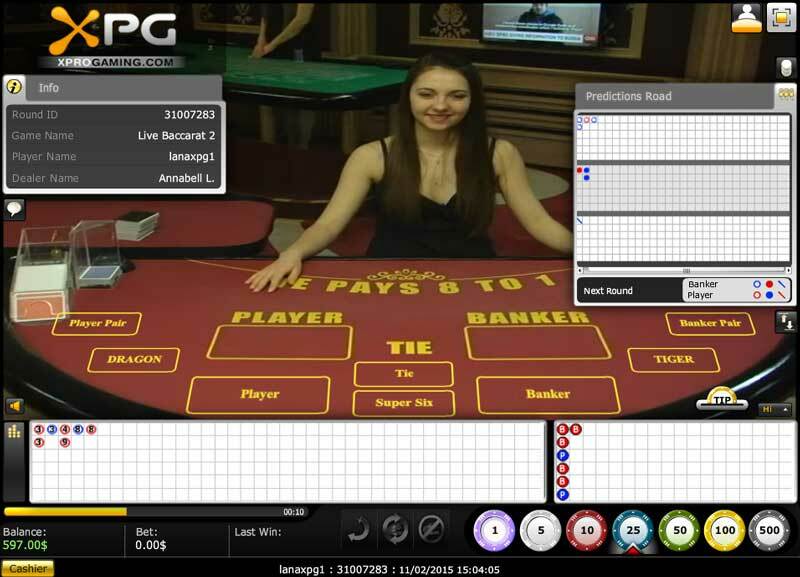 Streamed from the Portomaso Casino in Malta. 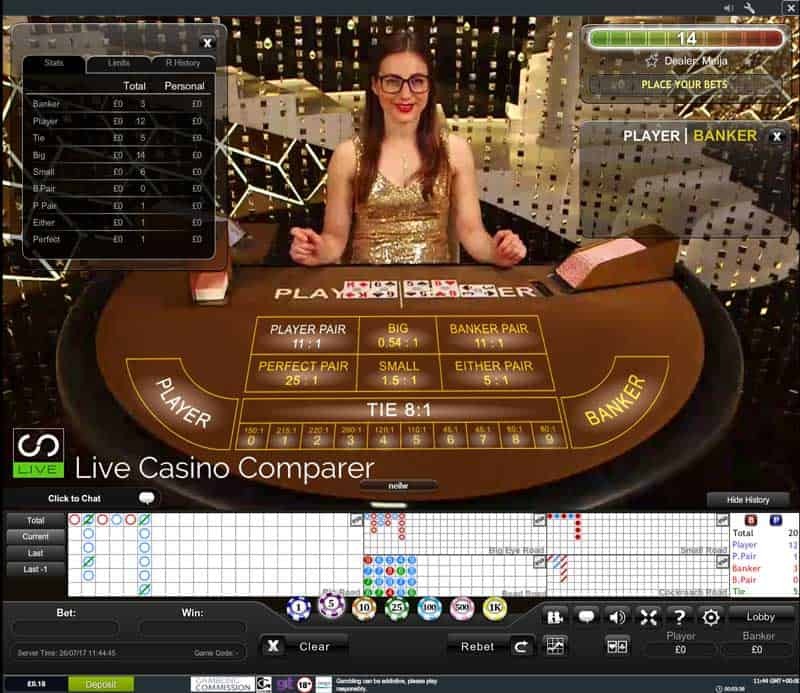 Streamed from the Oracle Casino in Malta. There are no Side bets. The main difference between Bet On Baccarat and normal Baccarat is when you bet. It’s possible to place a bet after the dealer has dealt each new card. Whether cards will be Odd or Even. BetConstruct and BetGames both have versions of this game although there are slight differences between the available betting options. The game rounds can take a lot of time due to the number of betting rounds in each game. This version is played with 8 decks. You can play the normal bet and side bets of Pairs, Big/Small. Colours – Total colours, more of one Color or the other, the same, the colour of the next card and so on. Suits – Whether the cards will all be the same suit, whether the cards will be the same or different, the suit of the next card etc. 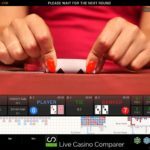 Totals – The value of the cards being above or below a certain number, the total of the player or banker cards. odds/Evens – whether the cards will be odd or even. This version is played with 6 decks. You can bet on: Number of cards dealt, The Colour of the cards and whether the cards will be odd or even for the Banker or Player. There are three betting rounds: Before the initial deal, Before the Bankers first card is opened and before the Players and Bankers second and if necessary extra cards are opened. You can also play the Pairs Side Bet. 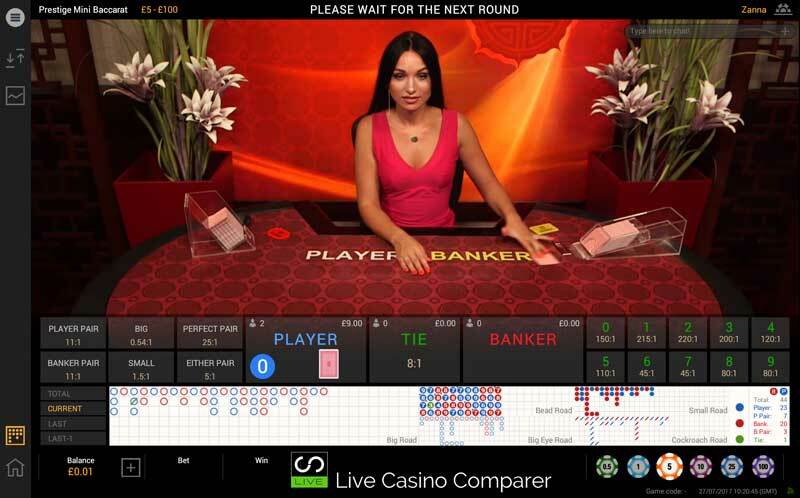 Essentially the base game of Live Baccarat is the same wherever you play it online. As I’ve discovered there is a wide range of “types” you can play, with different options and side bets. The differences in the sophistication and streaming quality of the solutions is quite noticeable. 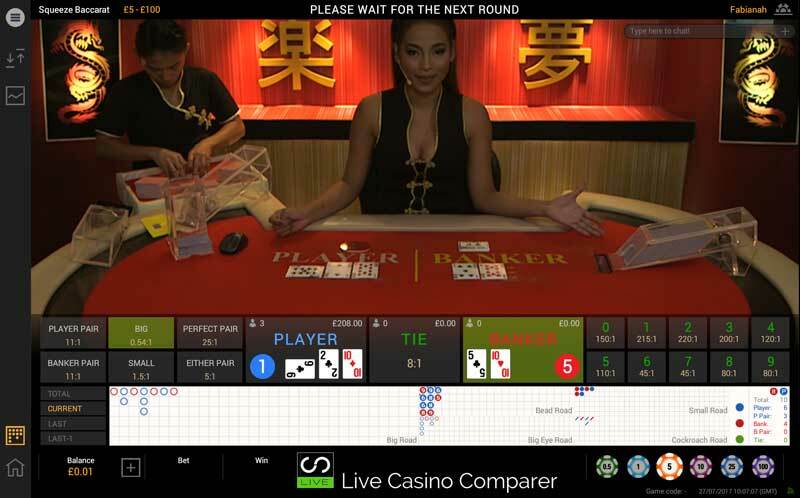 True HD streaming for Live Baccarat is only really available from Playtech and Evolution. 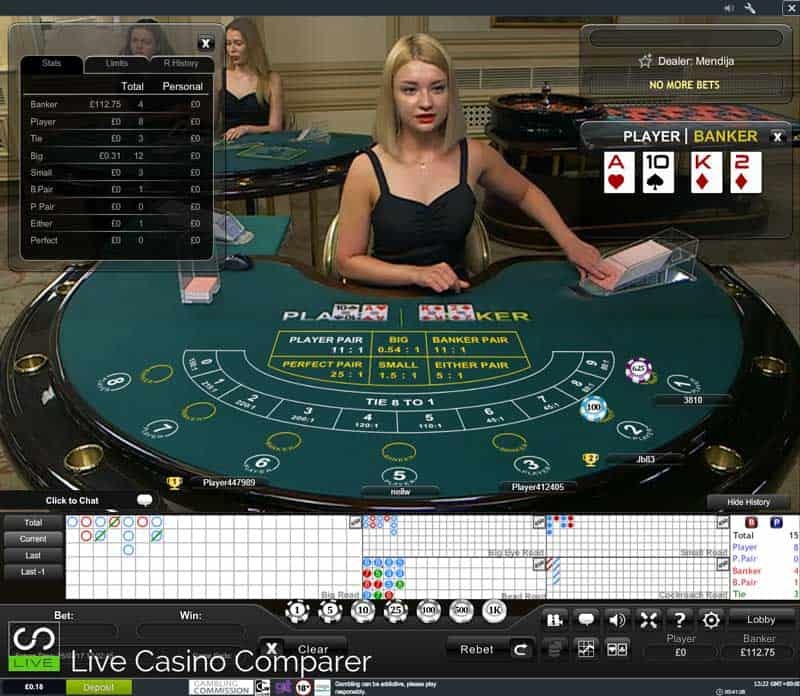 The other providers struggle to provide a consistent stream and its often better to play these in Mixed mode, where they stream a smaller picture superimposed on computer generated tables. They are equally as playable but maybe not as aesthetically pleasing to the eye. Land Based Streaming is starting to take off and I expect to see more versions of these tables go live during the course of 2017.